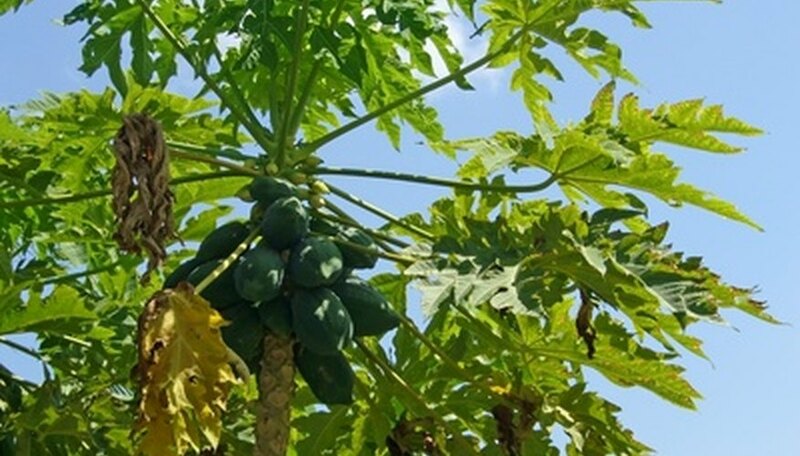 The papaya tree is a tropical weather-loving, fruit producing tree that is believed to be originally from Mexico and areas in Central America. It is grown in every sub-tropical and tropical region throughout the world. In Australia the papaya is referred to as the Paw Paw tree and in Brazil it is call the tree melon or mamao tree. Papaya trees are known for being very fast growing trees but they are also known for having a short life-span. In order to grow a papaya tree successfully requires a very warm climate since papaya trees cannot tolerate even moderately cold weather. Locate an appropriate planting site for the papaya tree. The best location will provide maximums sunshine and offer reflected heat, such as along the south or southeast side of a house, as suggested by Texas A&M University. Cultivate a 3 to 4 foot wide section of soil in the planting site. Use a hoe to remove all weeds and their roots. Then use a shovel to turn over the soil to a depth of approximately 20 to 24 inches. Sift through the soil using a metal rake to pick out any debris, such as sticks, decaying vegetation, roots or rocks. Test the soil for drainage to make sure the soil drains freely. Papayas need excellent drainage or they can be killed by too much moisture. Dig a hole 16 inches deep by 12 inches wide. Fill the hole up with water and time how long it takes for the water to fully drain away. Ideally the water should be mostly drained away in 2 to 3 hours. If the water remains after 24 hours consider planting the papaya tree elsewhere. Dig a planting hole for the papaya tree that is 3 to 4 times the diameter of its planting pot and approximately 3 times its depth. The loose soil and large hole will help make the roots expand and grow faster. Scoop soil into the hole until the hole is the approximate depth of the planting pot. Cut along the sides of the planting pot using a pair of snips. Make cuts from top to bottom all the way around the pot until you can easily remove the papaya tree from its planting pot. Plant the papaya tree into its planting hole. Hold the papaya tree vertical in its planting hole while you back-fill the hole with soil to make it about 2/3 full. Pack the soil down using your foot then fill the remainder of the hole full with soil. Scoop soil around the papaya tree to form a 3 to 4 inch tall circular dam of soil. This will help when watering because enough water will be able to pool up to sink down to the root system. Fill the ring up with water slowly.